Lewis Hamilton admits clinching a fifth F1 world title would rank as his proudest achievement - but has insisted "I feel like I've got quite a lot left to do" in the sport. The Englishman will become world champion for the fifth time in Sunday's Mexican GP, live only on Sky Sports, if he finishes in the top seven - a position he has occupied at every race since July. Were he to do so, Hamilton would clinch the world title with two rounds to go for the second consecutive year despite a fierce rivalry with Sebastian Vettel and Ferrari. 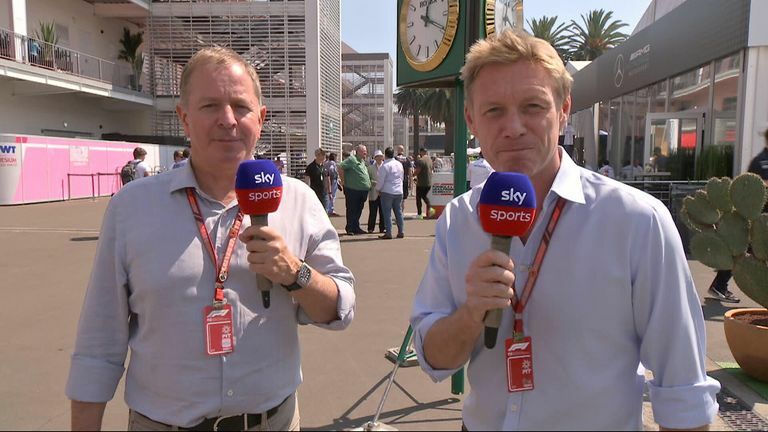 Sky Sports F1's Simon Lazenby and Martin Brundle discuss the major talking points ahead of the Mexican GP. The Mercedes driver insists when and where the title would be won is not important given the task of becoming champion is not getting any easier, a fact the 33-year-old appreciates more with age. "Just winning the championship has always been the goal," he said in the Mexican GP paddock. "I remember when I won my first, one of the ex-champions had said its always harder to get the second, which it felt like it was. The first one felt incredibly hard already but from then on it just got harder and harder to win a championship. "Even though you're improving, the competition improves, different circumstances arise, but this year particularly has been one of the most enjoyable years with the things that I have been faced with. "So if I were to win the title, I think it would definitely be one that I would be probably most proud of and be able to appreciate most. "Just being that I'm older and that's what happens when you get old, I guess." Hamilton recalled how he "did not sleep in Abu Dhabi" when the title went down to the wire against Nico Rosberg in 2014 and 2016. "In the past sitting back and watching grands prix on TV with bacon toasties in the morning, I would have wanted it to go to the end. But I'm not in that seat," he said. "When you're in it and living it you just want to get it done. As long as you get it done." Few are backing against Hamilton closing out the championship in Sunday evening's race to cement his place among F1's legends - but, with a new two-year contract to come at Mercedes from 2019, he has already made clear he is far from finished yet. "I do feel like I've got quite a lot left to do, so just going to get on with it," he promised. While Vettel's challenge has faltered repeatedly in recent months, Hamilton's has flourished to put him on the brink of an early title coronation for the second time in a row. Yet despite being on the cusp of a significant piece of F1 history - only two drivers have previously won five titles - Hamilton has appeared calm and relaxed in both Austin last weekend, when he had his first outside shot at the title, and again on his arrival in the Mexican paddock. "I've been here before," said Hamilton when asked if he could explain his calmness. "It's just the place I'm in my life I guess. Being that I'm just older, I've had the experience and know what I need to do to get myself into shape. "I'm just really enjoying racing. I'm here to race. I'm here to win. I'm here to deliver this championship for the team. So I choose what I put my focus towards, I don't really allow any negativity in, so I'm just on a positive wave. "If I was here and there was one point between us, I'm sure things would probably be a bit different. It would be a lot more intense. I've got a decent amount of points ahead so I guess that naturally does help a little bit, but I think it's more the experience." 3.45pm: Practice One build-up LIVE! 4pm: MEXICAN GP PRACTICE ONE LIVE! 7.45pm: Practice Two build-up LIVE! 8pm: MEXICAN GP PRACTICE TWO LIVE! 3.45pm: Practice Three build-up LIVE! 4pm: MEXICAN GP PRACTICE THREE LIVE! 7pm: MEXICAN GP QUALIFYING LIVE! 6.30pm: On The Grid LIVE! 7.10pm: THE MEXICAN GP LIVE!